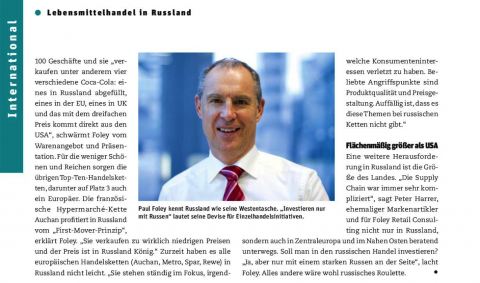 In April 2016, Paul Foley, Managing Partner of Foley Retail Consulting, was interviewed for the CASH magazine – Austria’s leading trade magazine for the entire food retail industry and branded goods industry. Paul Foley talked about the volatile Russian retail market and the future consequences for the food retail industry there. Over 50% of the food bought in Russia is still purchased in “Mom and Pop” style small stores called “Produkty”, literally meaning grocery store. However, this traditional industry is shrinking in favour of modern chain stores, there are already some large players on the market, of which the chain Magnit is the clear number one with nearly 11,000 outlets and a turnover of 16.7 billion Euros per year. Magnit is the chosen store for the around 40 million Russians, who have a budget of less than 500 Euros per month. At the other end of the income scale is the “Alphabet of Taste” – Azbuka Vkusa, a temple for luxury food products with around 100 stores, but only in Moscow. The French hypermarket chain Auchan benefits from the “first-mover advantage” in Russia. Their secret is their prices are low, and price is king in Russia! Imported products or even ingredients are significantly more expensive than 18 months ago and people’s incomes have not raised pro-rata. In real terms the Russian consumer has to stretch their spending budget to a point where consumption has fallen by 5% in the past 12 months. However, it is currently not easy for any European retail chain (Auchan, Metro, Spar, Rewe), as they are under constant focus from the Russian authorities if they have violated any consumer interests (popular points are product quality and price policy). What is noticeable is that there are many less issues with Russian chains. Another challenge in Russia is the size of the country. “Russia’s supply chain has always been quite complex“, adds Peter Harrer, Senior Consultant at Foley Retail Consulting. If you are planning to invest in the Russian market, you should have a strong Russian partner at your side or a very price focused concept! Have a look at the full article (in German) here and contact us for more information on retailing in Russia!